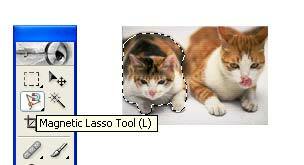 Lasso tool is a area selecting tool used in images in photoshop. This is a flexible selecting tool used with mouse movements. These are different types of selecting tools. These tools will not have any pre-defined shape. After clicking the pointer over this Lasso tools button , the following three options will come out. These are Lasso tools to select any shape in images. 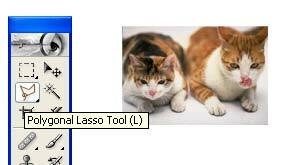 Select the Lasso tool, which will be highlighted on click. Lasso tool is used to select the desired area with free hand dragging with the mouse. Just take the tool and drag the mouse to select a particular area freely. We must meet the starting and ending point to close the selection. The selection is visible in the form of dotted lines. Now we can do any thing to the selected area. 2.Polygon Lasso Tool: Below the Lasso tool we are having Polygon Lasso tool.This tool is used to draw straight edged selecction.To draw a free hand segment,hold down Alt and drag.We must close the starting and ending point of the selection. 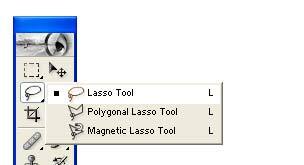 3.Magnetic Lasso tool: This is the last Lasso tool. Just select the tool and go on clicking around the image. The drawn selection is automatically snapped to the border of the selecting image. After joining the starting and ending points the selection will be visible. To erase recently drawn segments and fastening points, press the Delete key until you have erased the fastening points of the desired segment.